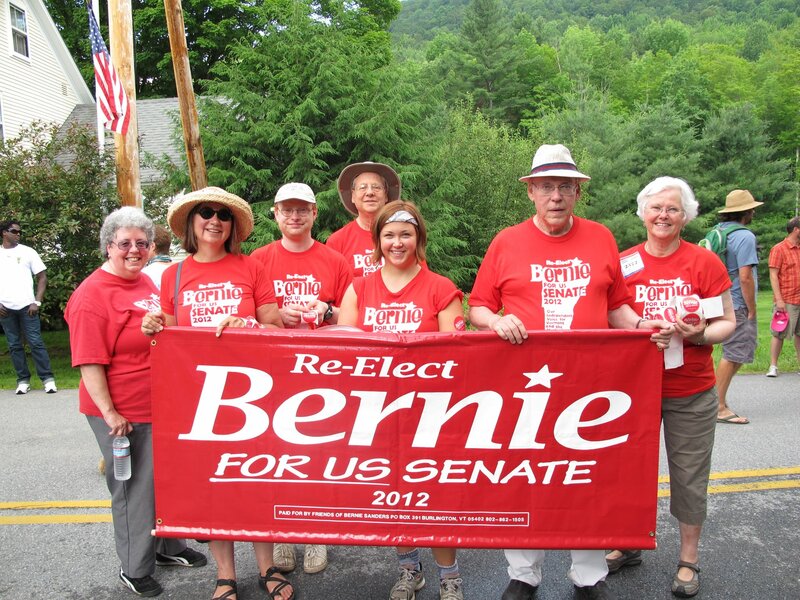 Getting ready to march with Bernie Sanders in the Warren, VT Fourth of July parade in 2012. I’m in the river with some pretty good people, which makes a huge difference in my life. The support I feel from loving friends, family, colleagues, and community gives me strength and courage to do the happiness work I feel called to do. They are good to me, we are in right relation for the most part, sometimes we get to celebrate. Hopefully, most of you can say the same. Relationships are the number one predictor of happiness. We need love to flourish under the best of circumstances. As we move forward to combat climate change and push for a shift away from dysfunctional capitalism toward a well being paradigm, we will need that love even more. All the loving kindness that flowed through the vast river that was the People’s Climate March brought to mind some experiences I’ve had in the presence of another warrior for well being, Senator Bernie Sanders. Talk about being in the river! He’s like the painting of George Washington standing up in the boat crossing the Delaware River. I know many of you who live outside Vermont are cheering this 21st century leader onward. Rest assured, on the home front in Vermont, there are throngs of people eager to celebrate his courage, tenacity, and heart in standing up for economic and environmental justice. Yes, it’s true: we love Bernie. Twice I’ve had the opportunity to march with Bernie in Fourth of July parades when he was campaigning for U.S. Senate. The first time was in 2006 in Montpelier, Vermont. My friend Judy and I were asked to march right behind Bernie because the organizer liked our sign (Women of Maple Corner for Bernie). As we marched, Bernie would inspire wave after wave of enthusiastic loving appreciation. The crowd’s energy, directed at Bernie, also landed on us just a few feet behind him. It was intoxicating and invigorating, to feel the energy of love like that — just awesome. Even better, though, was the Fourth of July parade in Warren, Vermont in 2012 when Bernie was running for re-election. This time, I was one of the volunteers holding Bernie’s banner, just in front of the Senator himself. Over and over again, as large chunks of the parade watching crowd shifted their attention from the float in front of us to the campaigning Senator, massive cheers erupted — and again, the waves of love and gratitude washed over all the volunteers as well. I heard the same enthusiastic shouts repeatedly, through the entire parade: “We love you, Bernie!” “Thank you Bernie!” And the occasional, “Bernie for President!” The love and gratitude were overwhelming. And, critically important. A few weeks later, after the parade season ended, Bernie launched his town meetings right next door, at the Maple Corner Community Center. Unlike most other Washington politicians, Bernie does not charge admittance to these events. Quite the opposite. He actually provides a free dinner to everyone who shows up! Amazing. But the salad and lasagne were not the reasons why the audience that night was enthusiastic. We were enthusiastic because of Bernie’s record. Like the parade crowd, we were filled with gratitude and love for Bernie and his staff because of the work they do. Before the Senator spoke, his staff member expressed his gratitude for our expressions of gratitude. He said, essentially, Bernie needs your love, needs to hear your cheers and your cries of thanks because, in D.C., Bernie’s work is damned hard. He needs to come back in Vermont, take a swim in the river with his supporters here who will celebrate with, and be good to, him. Like most relationships, it’s circular: we need Bernie, and Bernie needs us. Right relation. Being good to each other. Celebrating. 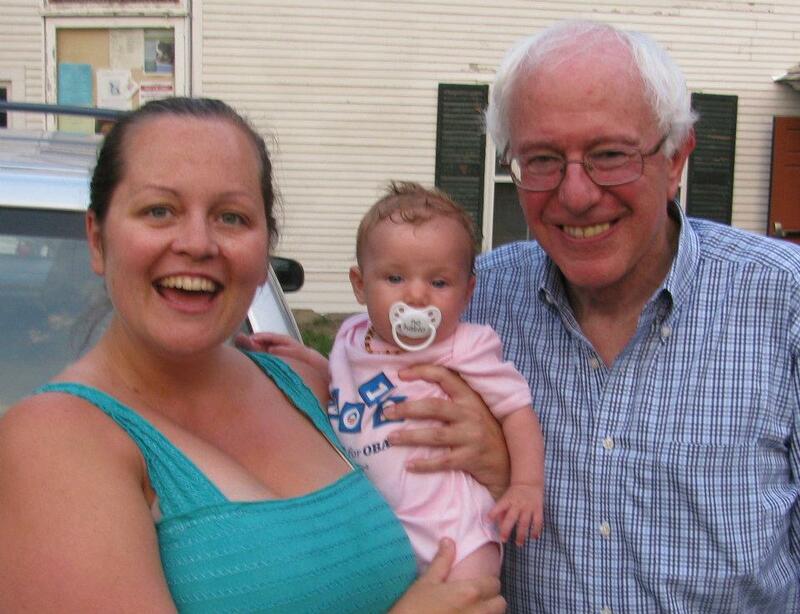 My daughter Jennifer and granddaughter Madeleine with Bernie Sanders in Maple Corner in 2012, just after his presentation and moments before the baby melted down. Afterwards, before leaving Maple Corner, Bernie paused to share the love with my daughter and four-month-old granddaughter. I’d say two out three of them were happy to have their picture taken together! Anyway, I’m grateful for the photograph. We all need to share the love. Even in our little corners, we can’t do it alone. We need relationships. We need community. We need love. Fortunately, love comes in a wide variety of packages — from what Barbara Frederickson calls “micro-bursts” of love which can occur even between two strangers who are momentarily connected, to long term relationships with intimate partners and best friends. And in a way, that’s what the whole trip was — giving and receiving micro-bursts of love, as well as weaving deeper more loving relationships with the people who are near me in the river. This was especially true for Ginger, a friend from central Vermont who generously shared her New York City apartment with me and my happiness colleagues Linda and Paula — who are now Ginger’s friends, too. Ginger met me at Penn Station, thus soothing my fears of having to negotiate the streets of New York City on my own. Paula arrived a little later, and Ginger fed us both a wonderful dinner. We watched a very funny video Saturday morning before a full day playing in a sunny NYC — a free ride on the Staten Island Ferry, a free walk across the Brooklyn Bridge, and indescribably delicious street food at an Italian Street Festival. Then we welcomed Linda for a lovely evening of pizza and wine. Sunday, we had a hearty breakfast before heading uptown to march. 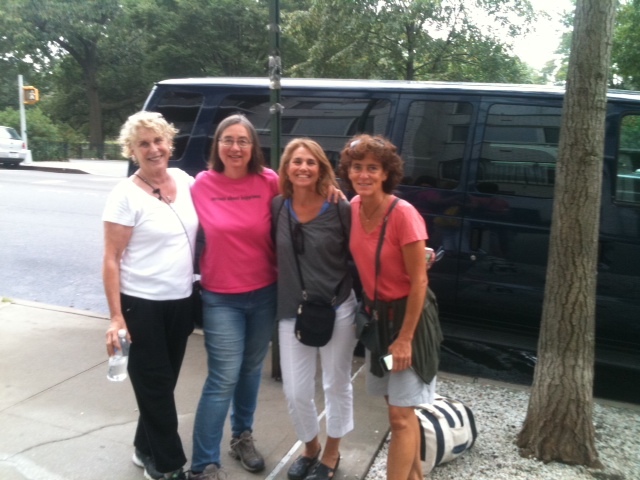 Ginger, me, Paula, and Linda getting ready to march! Thanks to a day of being good to each other, and celebrating, we arrived at the march fully supported (and supporting) in loving kindness. Once there, we were all able to be our best. When asked to help make and distribute signs, all four of us cheerfully and energetically jumped in and worked for at least an hour and a half. The march started very late, but it didn’t matter — our spirits were high. I felt at my best — able to be a happy, well-behaved member of a large crowd, take it in more fully, absorb it, and more ready to share and live the message of the march when I got home. Okay, honestly, I wasn’t actually at my very, very best for the entire march. Toward the end of the climate march, there was a small group of individuals holding anti-abortion signs. I thought, if you’re really pro-life, you should be in the march!! We’re talking about trying to save all human life — and most animals and plants, too — from extinction. How pro-life can you be?? But I wisely kept my mouth shut. A few steps later, though, stood another “protestor” holding a sign, something to the effect of “Come to Jesus.” All I could think was, seriously? Don’t you think Jesus would be marching with us? Annnndddd … that came bursting out of my mouth. I hollered, “Jesus is over here.” Surprise, surprise, that was not well received. He yelled back at me “no over here” and I yelled something like, “no, over HERE!” It was not a particularly sophisticated or mature exchange. But I was not in the river alone. I could just feel my friends looking at me. Imagining my behavior through my friends’ eyes helped me step back from my unhelpful behavior. I took a deep breath, and returned my focus to the march. Thank goodness for friends! I guess we need them in the river with us sometimes to throw us life preservers. That, too, is important. LOVE THIS Ginny, Wishing you micro bursts of LOVE! Wow, Cate, you are so fast! I just hit publish. And thank you, thank you, thank you — you, too, are all about the love!